PROTECT YOUR CHILD'S CAR SEAT WHEN TRAVELING- Built to protect child's car seat from dirt, mould and water so parents like you can have a peace of mind that it's bacteria free when your child uses their seat or travel stroller. FREE UP YOUR HANDS IN BUSY AIRPORTS - you can focus more on your children and your trip. Includes 2 adjustable shoulder straps to make it easy to carry in busy airports. Travelling with a young child can be stressful especially if you need to bring their car seat and stroller. With free hands you are more in control making your baby travel easier. COMPATIBLE WITH MOST CAR SEAT BRANDS- Made with high quality materials, you will never have to worry about the bag ripping. 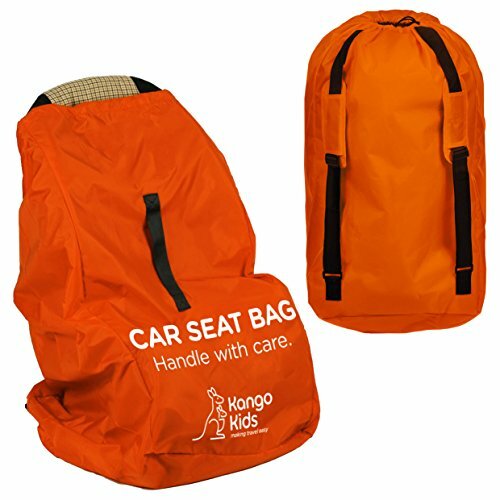 KangoKids Infant Car seat coveris compatible with most car seats and stroller brands including convertible. Folds down easily and stores into a pouch to fit into your purse. It's also ideal for storage of unused car seats at home! - SATISFACTION AND 2 YEAR MONEY BACK GUARANTEE. ✈️ TAKE THE STRESS OUT OF TRAVELLING WITH SMALL CHILDREN - Take your own toddler car seat with you, but know it is protected. Our travel car seat protector is brighty colored to easily spot and folds into a compact pouch to fit into your handbag. XL stroller bag for airplane will fit most major brands of portable car seat, convertible carseat and lightweight stroller. ✈️ SAFE AND HAPPIER KIDS - With our carseat travel bags, you can take your child's car seat with you whenever you travel, SAVING MONEY and never having to worry about vehicle safety. These car seat covers and baby gate check bags are water and mold resistant to protect your car seat from germs. ✈️ FREE UP YOUR HANDS TO LOOK AFTER YOUR BABY -  Gives you more carrying options with backpack style including 2 padded shoulder straps or using the reinforced handle. You can carry your baby bags and other baby products at the same time. Ergonomically designed so your baby car seat is comfortable to carry through the airport. ✈️ SAVE MONEY BY PROTECTING YOUR EXPENSIVE CARSEAT - Heavy duty, durable and tear proof carseat travel bag with drawstring closure and flap over opening to ensure car seat carrier does not open or get damaged in transit. Ideal for checked baggage. Recommended as a car seat storage bag to keep your baby seat clean. ✈️ WHAT AMAZON CUSTOMER SAY - "Fits really large seats and very strong", "now you can enjoy your air travel adventures with your little ones with less stress". SATISFACTION AND 2 YEAR MONEY BACK GUARANTEE for your peace of mind. If you have any questions about this product by KangoKids, contact us by completing and submitting the form below. If you are looking for a specif part number, please include it with your message.